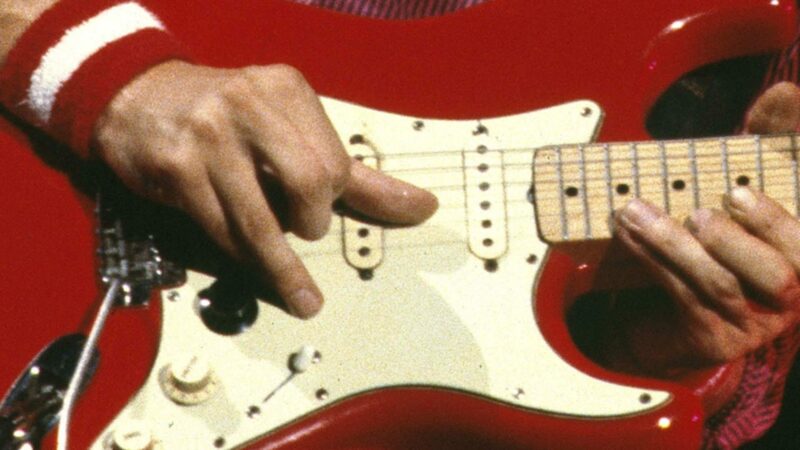 I think I wrote a blog post about Albert Lee’s cover of Setting me up from the first Dire Straits album before (see here). Today I surfed into this video clip on youtube which I really like a lot. It is a bit on the slow side, much slower than e.g. Albert’s live version that was featured on Eric Clapton’s Just one Night live album. It seems the older you get the slower you play but with more emphasis on the groove and on details. Reminds me on Mark’s recent versions of Telegraph Road which is also much slower these days but so rich of new details and has such a nice flowing feel. Albert Lee, originally one of THE Telecaster heroes, switched to a Music Man signature model a long time ago. Speaking of Music Man, just like Mark Albert played Music Man amps – often a 4×10 combo – in the late 70ies and early 80ies. On this clip we hear him over a Fender amp, seems to be a Tone Master. While Mark used to play Setting me up in an open A tuning (some years later he changed to standard tuning) , Albert always played it in standard tuning and in the key of D (the Dire Straits version is A).